A month or so ago, I had an email from the Ffestiniog Railway letter service asking about using a photo I’d taken on one of set of covers marking the issue of stamps featuring Welsh castles. The image in question was this one of the Baguley-Drewry diesel Criccieth Castle arriving at Porthmadog. All the photos I upload to Flickr are posted under the Creative Commons attribution licence, so I was happy for it to be re-used, but it’s always nice to be asked. Anyway, waiting for me when I got home from the excellent Narrow Gauge South exhibition yesterday (photos soon!) was a package from the FR with a sample of the cover. Now what’s the old pun about philately getting you nowhere? 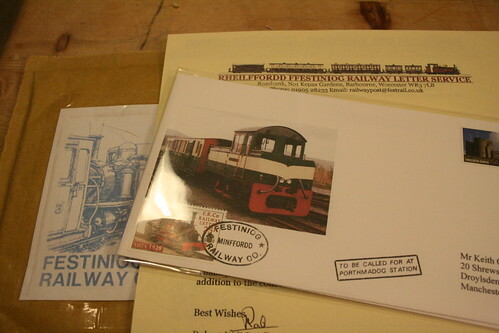 This entry was posted in 2' gauge, ego trips, ffestiniog, marketing, narrow gauge, photos. Bookmark the permalink.